February 2019 – Java, SQL and jOOQ. jOOλ is our second most popular library. It implements a set of useful extensions to the JDK’s Stream API, which are useful especially when streams are sequential only, which according to our assumptions is how most people use streams in Java. But that’s not the only thing jOOλ offers. It also ships with a set of useful Collectors, which can be used both with JDK streams, as well as with jOOλ’s Seq type. Most of them are available from the org.jooq.lambda.Agg type, where Agg stands for aggregations. Just like the rest of jOOλ, these collectors are inspired by SQL, and you will find quite a few SQL aggregate functions represented in this class. These are pretty self explanatory, I think. 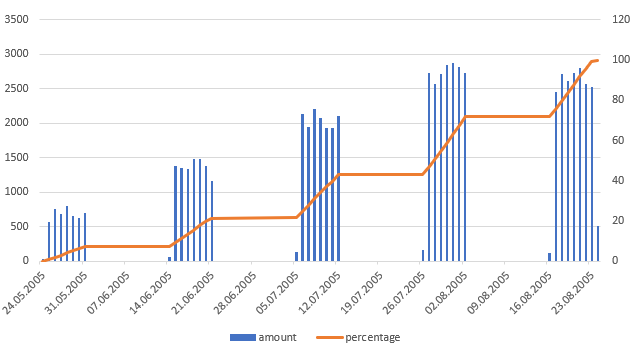 Just recently, I’ve blogged about the usefulness of SQL’s percentile functions, and how to emulate them if they’re unavailable. Bitwise bitAnd() and bitOr() collectors that aggregate all numbers in a stream using bitwise operators. allMatch(Predicate), anyMatch(Predicate), and noneMatch(Predicate) collectors, that mimick the behaviour of the corresponding Stream method, but as a useful boolean collector, which is similar to PostgreSQL’s EVERY() aggregate function. first() and last() functions, which will produce the first and the last value in the stream.